Описание:Advanced training in the effective use of the ultimate business weapon The Internet is a versatile and dynamic tool. In the escalating war for market share, it is both the primary weapon and the principal battleground, the ultimate reconnaissance vehicle and the swiftest possible messenger. To prevail in the Internet wars you need to be thoroughly steeped in the ancient principles of competition and conflict and well versed in the innovative tactics and strategies proven to win market share in the competitive economy. 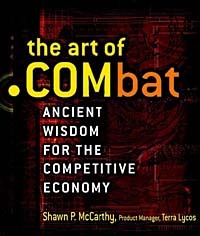 The Art of .COMbat combines the revered teachings of the worlds first and greatest military theorist with the savvy approaches of todays most successful e-warriors. It shows you how to size up your own company, the competitive landscape, and your opponent; use the Internet as a weapon to wage business war; develop offensive and defensive strategies; maximize your organizations competitive punch; and much more. Youll learn how to use the Internet to create and control new markets, develop and promote new products, perfect your supply chain, communicate with customers, and gather intelligence about the competition. And, youll discover how to avoid unnecessary battles, create win/win situations, and take full advantage of global connectedness. If youre not prepared for .COMbat, you can be sure that your competitors are. Arm yourself today with The Art of .COMbat and prepare for victory in todays survival of the fittest.